On the evening of 23rd February i attended the signing ceremony between Amanah Raya Berhad and Paradise Wealth Sdn Berhad at the Deer Suite, Crowne Plaza. I would have thought that this was just another official function which I have to attend But the topic of the event was related to the assignment of Wills and Estate Management. That tickled my curiousity. It was indeed a serious topic, as it involves the distribution of wealth after a person dies. That is a very scary and taboo subject for some people - the idea of death. But I like the way the Amanah Raya Managing Director Y.Bhg.Dato' Ahmad Rodzi bin Pawanteh explained it that night - 'Death is certain. One day we will die. Other things we can never be sure of'. (h) any creditor of the deceased, who shall enter into a bond for such amont and with such sureties, or has furnished such securities, as the Probate Officer shall require. Most of the Sarawak Administrative Officers in the District Offices are quite well versed with this ordinances and the issuances of this Letters of Administration. Being probate officers is part of their functions as they handle the various cases in their Districts and everyday there are such instances where relatives dispute over the estates of their loved ones who have departed. Its not an easy task and usually the issuance of the Letters of Administration takes quite a long time to settle with protests and counter claims from the living relatives. The main problem in the existing ordinance, as pointed out by YB Puan Lily Yong, the assemblywoman of N.8 Padungan, who officiated the function, is that existing Ordinance seems to lean heavily towards the male inheritors. The male relatives seem to be in a more favourable position to acquire what gets left behind. If you a lady is a second wife for example (but does not know she is one) and upon her husband's demise she discovers he has a first wife who will be the rightful claimant to whatever 'wealth' is left by the late husband. Sometimes the first wife may be surprised that there is a second wife who also wishes to claim what gets left behind. It gets complicated. So let the ladies out there beware. It does happen and I do hope that this gets to be highlighted in the next Dewan Undangan Negeri sitting. I believe it deserves serious consideration bearing in mind that sometimes the authorities who issue the Letters of Administration have a hard time trying to settle these issues. I had the bitter experience at one time in deciding a similiar case - the husband died and two women came to me to assist them to process their rightful claims (EPF, bank accounts, etc). They both had children with the deceased. It became more difficult when I discovered that the first wife was married to the deceased the 'longhouse way' (no paperwork - just longhouse witnesses who claim to attend the wedding ceremony) and the second wife was a civil marriage (the second wife had the marriage certificate). It does lead to some disputes along the way but the best way is always to convince them to share rather than fight over it which was what I managed to advice them to do. There was a request from the owner (Mavis)that I do not blog about this place. So i do not know how to approach the subject. Maybe providing photos is tantamount to 'photo blogging' which will also cause the wrath of the owners. However, lets see what I can do. I will just just provide the description of the photos without mentioning the name of the place. That I believe would be acceptable to any laws in any country. So let's just assume its called 'The Place'. If you are curious about The Place, just click on the links of the bloggers whom I met there, I am sure some will provide the description of The Place more elaborately. My drink that night - Doctor's Cooler: Its a mixture of Apple. Since there was no Beer that night, I had to take something that would be equivalent to beer drinking and that was to take the juice from the Forbidden Fruit. The Japanese sitting set up - where are my Geisha Girls? That's right, this is definitely the place to Chill Out and Relax - I discovered that Francis can even afford to sleep there. Well done Desmond! You managed to pull off the 'challenge' of blogging the place and yet not blogging it! Now, we'll have to wait for Felicity to see what 'angle' or approach she's goin' to use next! Strange that the owner does not want some free publicity!! nice review on the Gathering pangyau, hehehe. n thanks for letting me know about my blog (only can be view on fiewfox). I need to fix that error later. 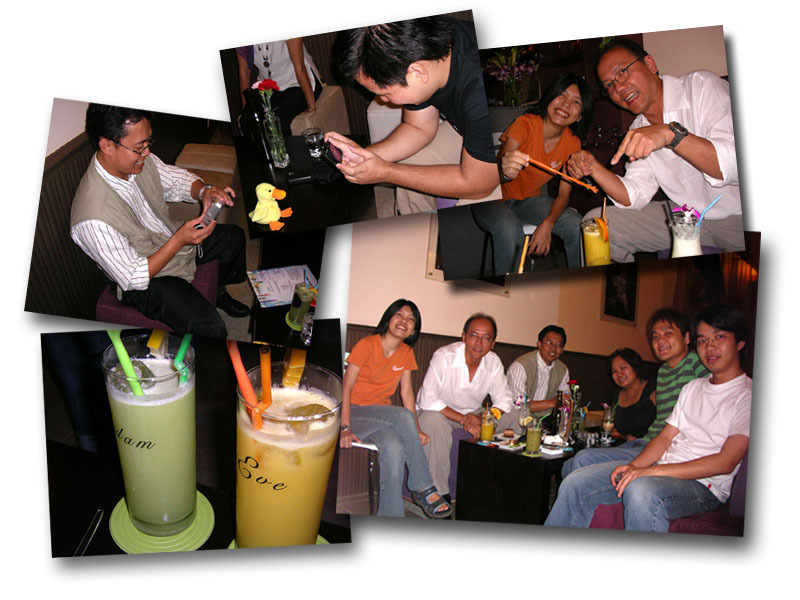 Is there any kuching bloggers meetup around here? I would like to attend one of those..